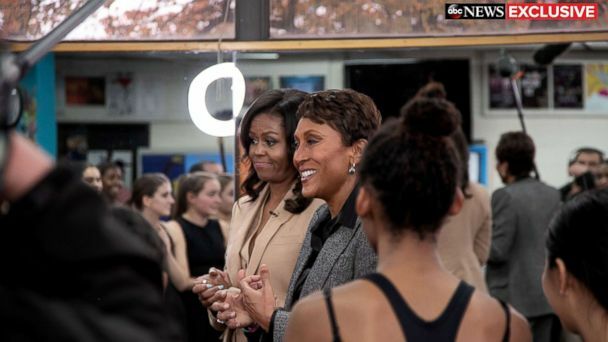 Former first lady Michelle Obama was greeted with squeals and shocked faces when she surprised girls in a dance class at her high school alma mater. Obama, 54, visited Whitney Young Magnet High School during a visit to her hometown of Chicago for an exclusive interview with with "Good Morning America" anchor Robin Roberts in early November. Their visit will air during a prime-time ABC News special, "Becoming Michelle: A First Lady's Journey with Robin Roberts," on Sunday, Nov. 11, at 9 p.m. ET. Obama's memoir, "Becoming," will be released on Tuesday, Nov. 13. As a photo of a young Obama, then named Michelle Robinson, hung on a wall nearby, the former first lady shared lessons with the girls about how she found her voice in high school. "I want you all to learn how to be advocates for yourself in this life," Obama said. "Because people will try to take your voice and shape it in a way that has nothing to do with who you really are." Obama also spoke candidly with the students about some of the obstacles she faced while serving as the first lady. "I had to fight stereotypes and notions that people thought they had about what a black woman from the South Side of Chicago should be," she said. "I was labeled as angry and not an asset to my husband, all because I was using my voice." She added, "Don't feel like something's wrong with you when you have some bumps in the road." When Isa Sanchez, a junior elected by the high school as a student body representative, asked Obama how she can help "make everyone as happy as can be," Obama responded with advice likely learned from her eight years as the first lady. "First of all, you stop trying to make everybody happy. It's impossible," Obama said. "That's not why people elected you. They've elected you because they trusted your judgment, so you've got to trust it." Obama stayed to watch the girls perform the dance routine they had been rehearsing prior to the surprise visit. "I'm so proud of you," Obama said after the performance. "Do not doubt anything." The former first lady ended her visit with a group hug with the dance students. "For us, in this moment, it was so inspiring to see someone who we look up to give us that boost of confidence," junior Payton James said at the end of the visit. "She could show that as females we can still speak our minds and not have to fade into the background," senior Lauren Radomski said of Obama's impact. ABC News Exclusive: Tune into the prime-time ABC exclusive special "Becoming Michelle: A First Lady's Journey with Robin Roberts," on Sunday, Nov. 11, at 9 p.m. ET.